This month’s Pitch DNA Insider was written by my longtime friend, business partner, and collaborator, auGi (pronounced, "AWWWG-EE"). Truth is, I know he spells him name in such a distinct way because he’s either (A) unbearably pretentious or (B) brilliant at branding himself. I'm gonna go with a smidge of column A, but mostly B. Some background: I met auGi during my early years in L.A. while we were both learning (by doing) the art of standup comedy. We became fast friends, driving hundreds of miles every week to perform at open mics, coffee shops, bars, and clubs. Our shared experience forged the foundation of our lives as professional speakers. auGi inspired me in many ways during those adventurous years, but his practical approach to getting what you want turbocharged my comedy career: develop a plan. I listened to auGi because, during the 90’s, he and two friends had built and sold a successful agency, so I knew his advice was battle-tested. It’s no surprise that auGi’s first Pitch DNA Insider post is how to plan your talk, presentation, or pitch from the ground up. 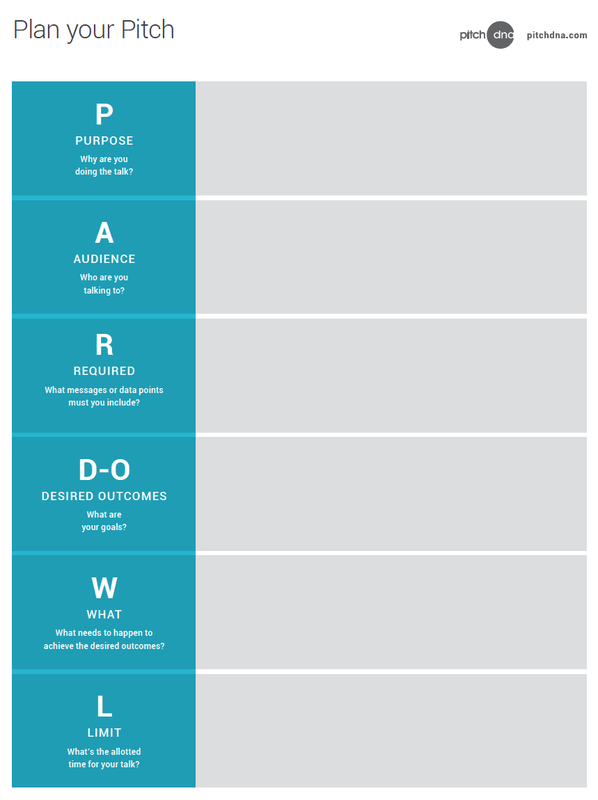 auGi just coached me on an upcoming talk using this framework and it’s made a huge difference. So buckle up, take out your notepads, and get ready to fly. auGi warming up a crowd in Portland, Oregon. Photo courtesy of Fireworks Photography. Stu’s introduction is spot-on. Except he forgot to mention that, the first time I encountered him, Stu was commanding a stage in Burbank, CA, doing a comedy bit about a long-haired, 1980’s rocker dude (think Bruce Dickinson from Iron Maiden meets a Domino’s Pizza delivery driver). Can you visualize it? Do you even know who Iron Maiden is? Little secret: Stu is one of the most cultivated, polished, and highly educated people I’ve ever met, but he also loves heavy metal prog-rock (and he’s also a drummer. Shhhh). Which is one of the reasons he’s a stellar performer and such a capable communications coach—he organically connects with people from all walks of life. So, planning. Why does it matter for your talk? Why can’t you just walk into a room and improvise about your new product, initiative, life story, or do standup, for that matter? Actually, it’s an acronym that emerged unceremoniously during a recent brainstorming session with Stu. But in that moment, an idea was born: a core of Pitch DNA’s mission is to help smart, ambitious professionals refine their pitches and presentations to their essence, which makes them easier for audiences to grasp. And since DNA is a genetic sequence—or a string of code—why wouldn’t the same apply to communications and language? PARDOWL may lack elegance, but it stands for something that will shape anyone’s talk. It’s the formula I’ve personally used to structure my own keynotes, speeches, and pitches, and I know it will make a big difference for yours, too. Purpose: Why are you doing the talk? Audience: Who are you speaking for? Required: What points or messages must you include? Desired Outcomes: What are your goals? What needs to happen to achieve the desired outcomes? Limit: What's your allotted time? For context, let’s break down one of my recent gigs to see how PARDOWL works. I was invited to emcee the annual Gala MS fundraiser in Portland, Oregon—a night of fine wine, locally-sourced gourmet cuisine, and the chance for me to plaster my 7th grade headshot on the opening slide. I was the former VP of Marketing & Events for the Nat’l MS Society in Oregon, their spokesperson for many years, and I had emceed a previous Gala MS, so I knew the mission and audience. But I was confident I could make this one better if I spent more up-front time mapping out the entire event. The first question I always ask: “WHY are YOU doing a talk?” If you don’t know, you could bomb. Well, I bombed enough during my LA standup years because I didn’t know what I was doing (at first), didn’t rehearse enough (at first), and everybody who does standup will go through a phase where they tank (18 months for me—not fun). The way to avoid bombing? Start with Purpose. For Gala MS, I knew my Purpose was to pave the way for a successful live auction and help the organization raise $100k. Tall order, but easy enough to wrap my head around. Who are you speaking for? What’s the demographic landscape? If I drop a reference to the Bionic Man, will the majority know what I’m talking about or think it’s the dorkier version of Burning Man? Knowing who you are speaking for will help shape both your script and your performance. Whether you’re hired to keynote a conference or presenting to your executive team, there will be a few messages you must include. For Gala MS, I knew the Society was going to play a video about the disease and how fundraising makes an impact, so aside from welcoming people to “Gala MS,” I only needed to recognize key sponsors, volunteers, and staff. The primary outcome, as I mentioned earlier, was to raise $100,000. In addition to raising money, the organization needed to educate newbies about the disease and provide a research update (both of which would be handled through a video), and further cultivate top donors and volunteers. W = What Needs to Happen to Spark those Outcomes? Now that I knew the outcomes, how could I help influence them to happen? Could I simply run around on stage like I did one night in 2004, at the Improv, as Pour Some Sugar On Me blasted over the sound system and two adoring fans poured an actual bag of sugar on my head? (Yes, this did happen and no, I do not recommend doing this at your next fundraising gala or Scrum meeting). 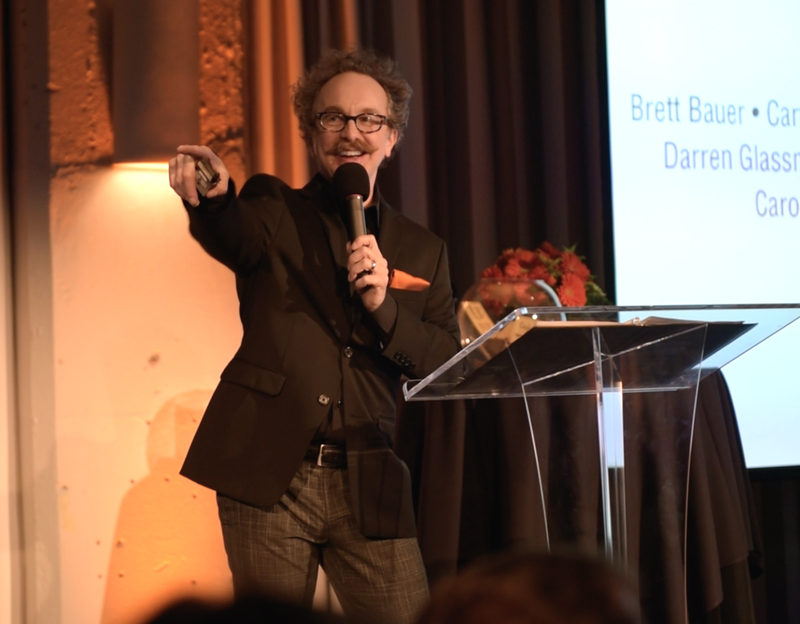 A great way to guide outcomes is to consider, “How do I want the audience to feel during my performance?” This was critical for Gala MS, because I knew from my nonprofit experience, sharing statistics does not inspire people to give. In fact, it has the opposite effect—it cuts giving in half. This is why tapping into emotions is so critical to public speaking. In most cases, people are going to make decisions from their heart, not their head. I totally understand that, if you’re pitching Bill & Ted’s Excellent Time Travel app to an investor, you also need to build a rational argument for your product, but I cannot emphasize enough the potential of electrifying your audience. For Gala MS, I wanted to prompt three emotions: Happy. Humbled. Hopeful. With these in mind, I scripted out the entire sequence to access those heartspaces. Good god. “Heartspaces”? I sound like my Aunt Betty. auGi speaking at Gala MS in Portland, OR. Photo courtesy of Fireworks Photography. Make a memorable entrance – I had the sound person crank up We Are Family—a tune that 95% of the audience knows. I knew this would flood their brain with a potent dose of nostalgia dopamine, get their blood flowing, and draw focus. I also danced* my way through the audience. This is especially critical in a big, noisy room where people are imbibing mind-altering spirits and still chomping away at their Napoleon Beet salads. You need to get their attention ASAP or you may never gain control. *Dancing optional. Especially my “dancing,” which is best described as C3-PO meets The String Cheese Incident. Warm up the audience with something unexpected – If you’ve ever watched Portlandia, you know our city is ripe with hipster comedy gold. So I developed a G-rated, Portland-oriented trivia game that would make everyone feel included, while poking a little lighthearted fun at ourselves. For each question, I invited the audience to raise their bid paddles for the correct answer. This served to bring the crowd together in a common physical action, and set up a positive mindset come auction time. Segue to the heart – After half a dozen silly questions, I dove straight into the mission, closing on “Why have we all gathered here tonight?” This allowed me to switch tone (humbled), and also insert a moment about my mom who lived with MS for over three decades. This justified why I had been selected as the emcee, quieted the audience, and created a bridge for me to introduce the auctioneer. 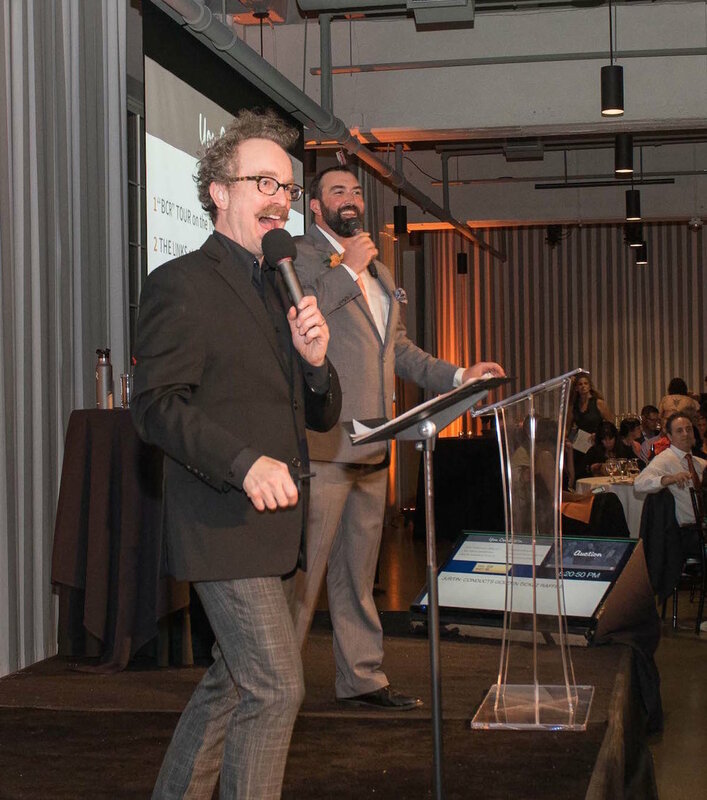 From then on, I was the auctioneer’s sidekick, reading each auction package description (which I also scripted for my voice), and keeping the program cruising along. The closing code for PARDOWL is simple: how much time is allotted for your talk? For Gala MS, I knew the total program (with auction) was an hour, but I had to squeeze my opening segment into eight minutes. Knowing my time limit forced me to get super creative. Knowing your talk’s time limit enables you to gauge your boundaries and streamline your content to its most potent state. auGi with Justin Timm (auctioneer). Photo courtesy of Fireworks Photography. Finding a way to link your talk’s Purpose to something meaningful will amplify your performance. It will help you connect more deeply with your message and the audience. And it will instill you with a greater sense of confidence. Because when you walk on stage—any stage—if you’ve invested enough time structuring your talk with goals, outcomes, and your audience in mind, everyone will leave that room ready to conquer the world. We hope this issue of Pitch DNA Insider was helpful. Feel free to reach out anytime. We’d love to hear from you!